Almost Heaven is a sauna manufacturer with a dedication to providing customers with the most authentic sauna experience in the industry. 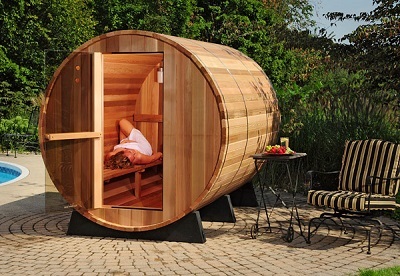 The barrel design that they use for their outdoor saunas helps to enhance efficiency of the sauna and heats the room much faster than most other types of room designs. The barrel design also contributes to durability as the ball-and-socket assembly makes the wood much less likely to split or crack the saunas with too many nails or screws. Their saunas are super easy to install and, as Almost Heaven claims, they can be put together by two people in less than a couple hours. They’re made from red cedar lumber and the artistry used to create them is obvious to users once they’re assembled. Visual appeal and authenticity are the two words that will come to mind once you’ve put your Almost Heaven sauna together. Each and every one of their saunas is covered by a lifetime warranty and are handmade by artisans at their shop in Renick, WV. All of their products are made to be able to perform equally both inside or outside, although they do have specific recommendations for each. Another great quality of the Almost Heaven saunas is that they’re designed to require little to no maintenance. So long as the sauna is assembled and placed on a flat surface, the Canadian red cedar used to create it is resistant to insects and water and should prevent the need for any type of ongoing maintenance. At the end of the day, the incredible authenticity and low maintenance needs of the Almost Heaven saunas makes them one of the best manufacturers in the United States and world.